Violet-purple flowers with a slight lilac flame on the edges. A show-stopper in the garden. Mid season flowering, 40 cm tall. With the widest colour selection, the single early tulips are great for mass displays and cut flowers. As their name suggest, single early tulips produce one flower per stem and bloom early to mid-spring. 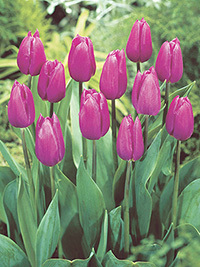 Single early tulips have very strong and sturdy stems which allow them to stand up to wind and rain with ease. These tulips are a great choice for forcing as they do not need as long of a cold period like some of the later larger varieties of tulips.